VoIP is an acronym for Voice over Internet Protocol and is also referred to as IP telephony. VoIP is a technology that uses IP networks for the two-way transmission of phone conversations via the Internet, or private LANs (local area networks) and WANs (wide area networks). Calls may be made computer-to-computer, computer-to-phone, or voip phone -to- voip phone, using a VoIP service provider. VoIP converts analogue voice signals to discrete digital packets that are transmitted over the Internet and then reconverted at the receiving end. 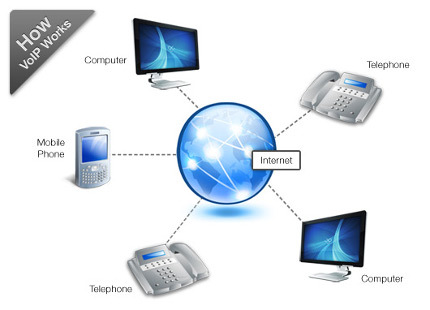 You can connect to a VoIP network using a VoIP Phone or a VoIP Adapter. Connect your phone to a high-speed Internet connection at your home or office. You can use a VoIP adapter to convert an analog telephone, I prefer to use a VoIP phone so you can use the full functionality of VoIP. You can shop online with many vendors for phones. Most service providers use SIP to communicate with the handsets, so make sure you get at SIP based VoIP Phone. I use Voiplink.com because they are local and have always been good to me. Once you have got your phone picked out you will need to find a good VoIP service provider to provide you with dial tone. I recommend using Voipreview.org to compare all the different plans. Plans change all of the time and they do a good job of keeping up with the latest pricing. * Make sure your the VoIP phone or adapter you buy is compatible with the service provider you select before you sign up! You can generally use VoIP to call anywhere in the world. It's becoming increasingly popular for International calls because of the low cost compared to regular long distance service. You can usually talk voip-to-voip at no per minute cost. Costs for local and long distance calls to analogue lines and cell phones will depend on your service provider. It's important to note, however, that your high-speed internet connection must be active. If your Internet service is down, your VoIP is down. Here's another cool youtube video using VoIP at home. Check back often for more VoIP news, products and tutorials!